Nick arrived in Bali a few weeks before we were set to meet him. 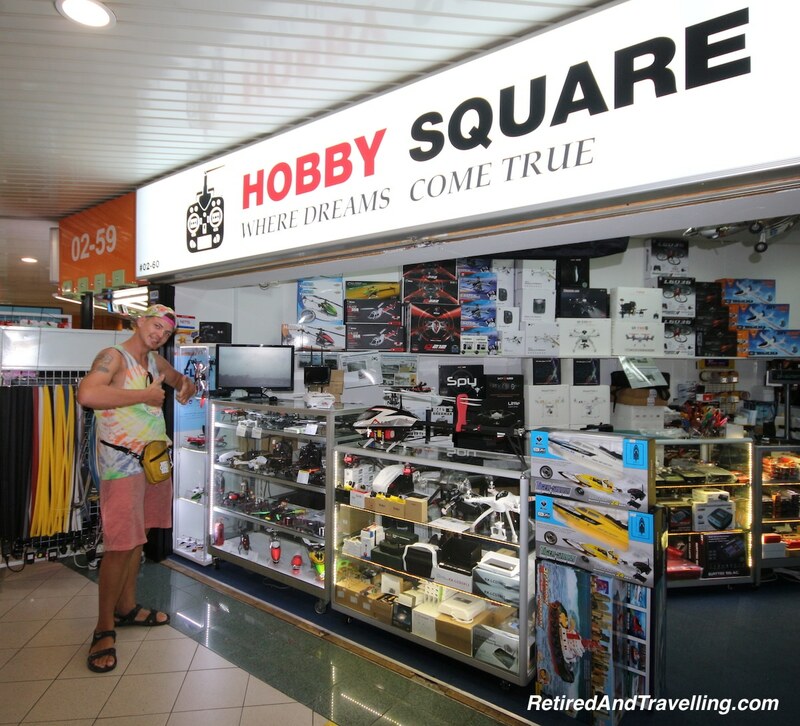 I was not sure if he would like Bali enough to stick around but he had no trouble keeping busy in Bali. As he had done when he was in Thailand on the first part of his trip, he was staying out of the typical tourist spots on his adventures through SE Asia. 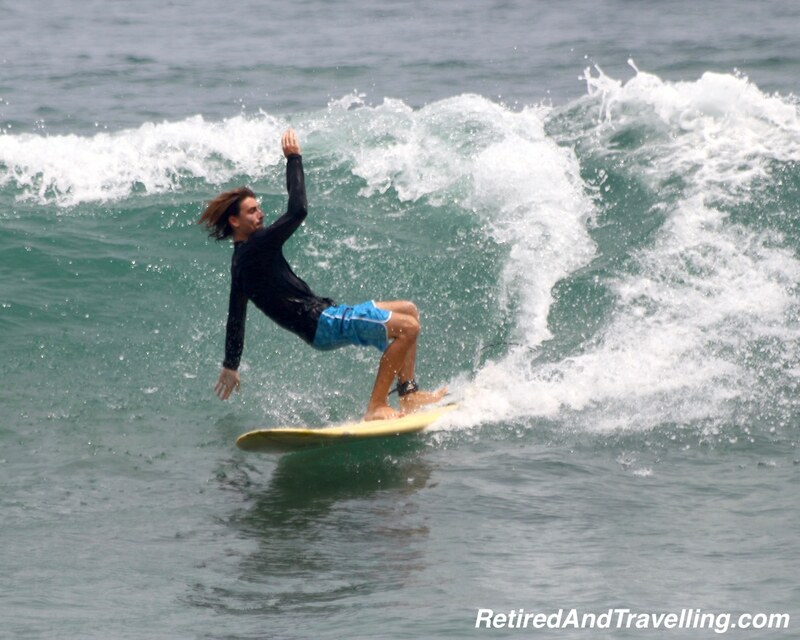 For a while Nick stayed with friends in a villa and then settled into the small seaside village of Canggu. Canggu would be one of the day trips he planned for us when we arrived. 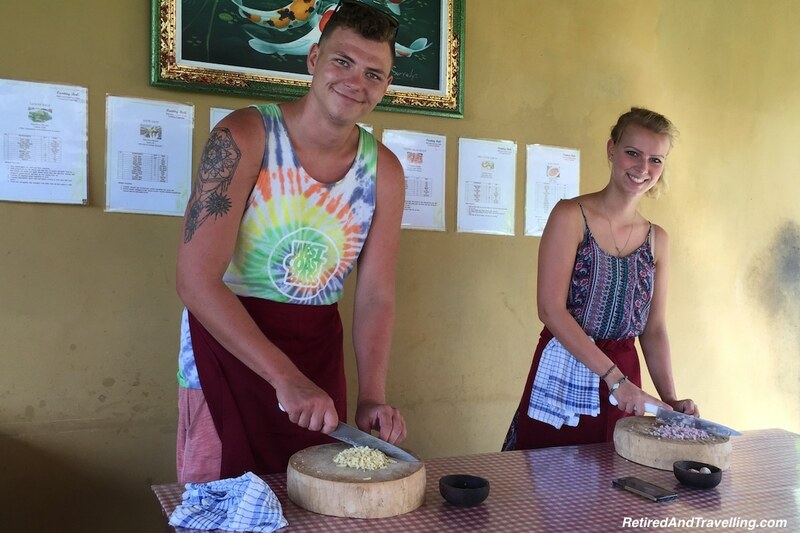 Nick found a good homestay and settled in to enjoy living like a local. He would be very disappointed when we showed up with reservations in a luxury resort on Jimbaran Bay. We could have rented a luxury villa for much less. But we were not comfortable on our first visit with trying to figure out shopping, services and transportation for a private residence. Not a bit concerned to be off the beaten path, Nick quickly found the local scooter rental shop. He would normally travel in his little Scoopi scooter but rented a small dirt bike for longer trips. This gave him the freedom to move about locally and head off for longer trips. He earned his “Bali tattoo” (road rash) one night when the scooter slipped out from under him on a gravel turn. Of course, he didn’t tell mom until we arrived. But he had made sure to visit a doctor and was religiously applying antiseptic to ensure healing and no infection. When he was not using the scooter, he found that Uber was a great option in Bali. Except for some locations where Uber was restricted, there was a good supply of Uber drivers with cars in good condition. The rates were definitely better than the fixed rates that taxi drivers insisted on. 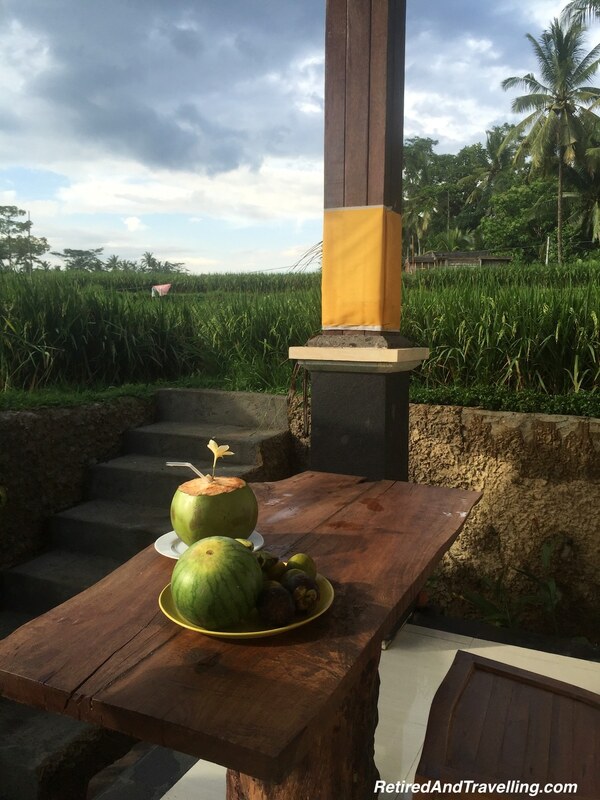 Nick travelled to Ubud for a few days. He found a great homestay and sent teasing pictures. His great spot in the country had its own kitchenette and an amazing view of a rice field. 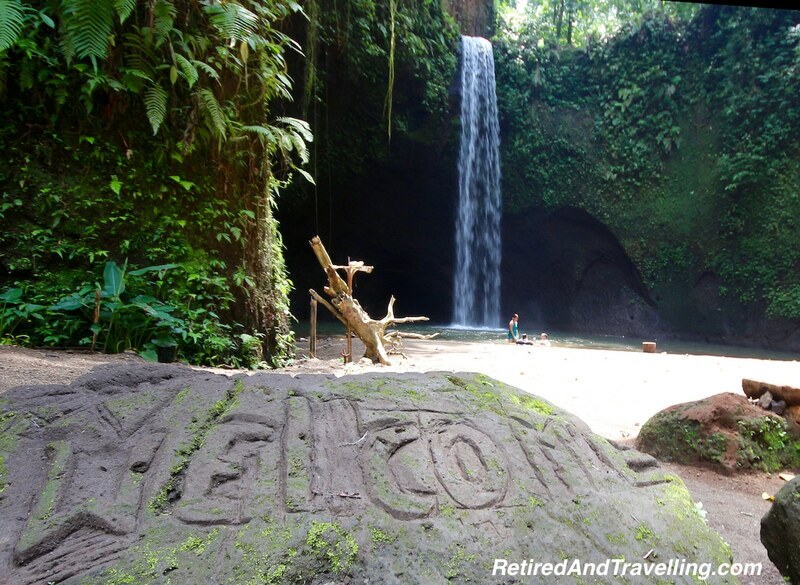 One of the Bali treasures he found was a lovely secluded waterfall. 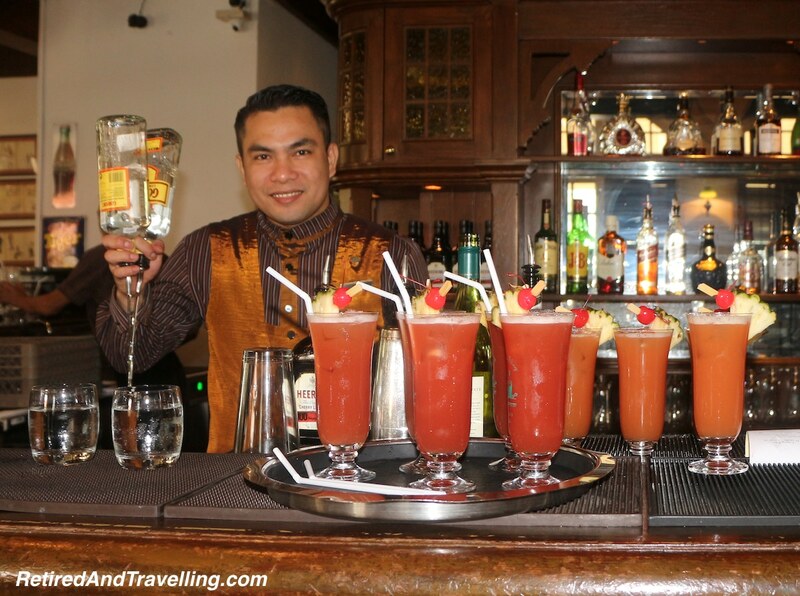 He enjoyed this so much that we planned to visit on our day trip to Ubud. This was a spot not known to our driver for the day so getting there on the narrow paths was an adventure on its own. 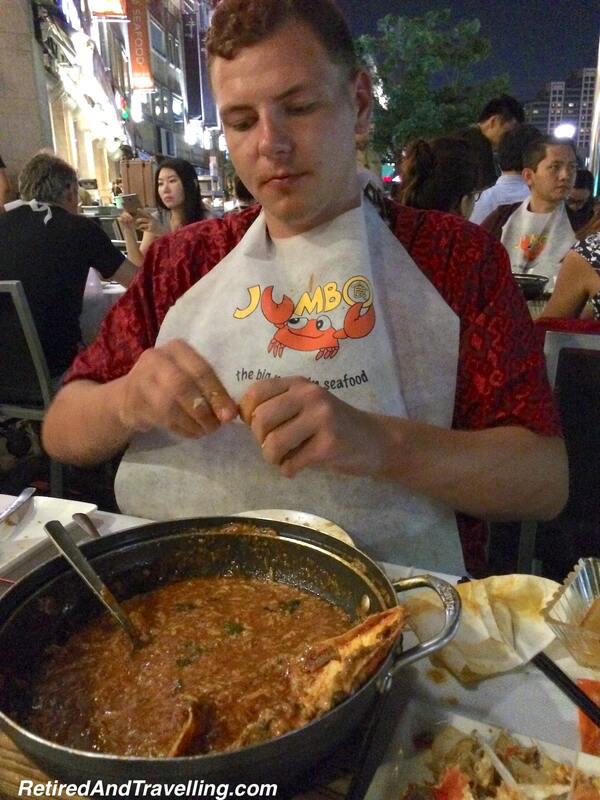 Nick booked a day to take a Thai cooking class. This was something we have have done on our travels in Italy. He spent the day learning about local foods, spices and traditions. The meal they prepared looked great! 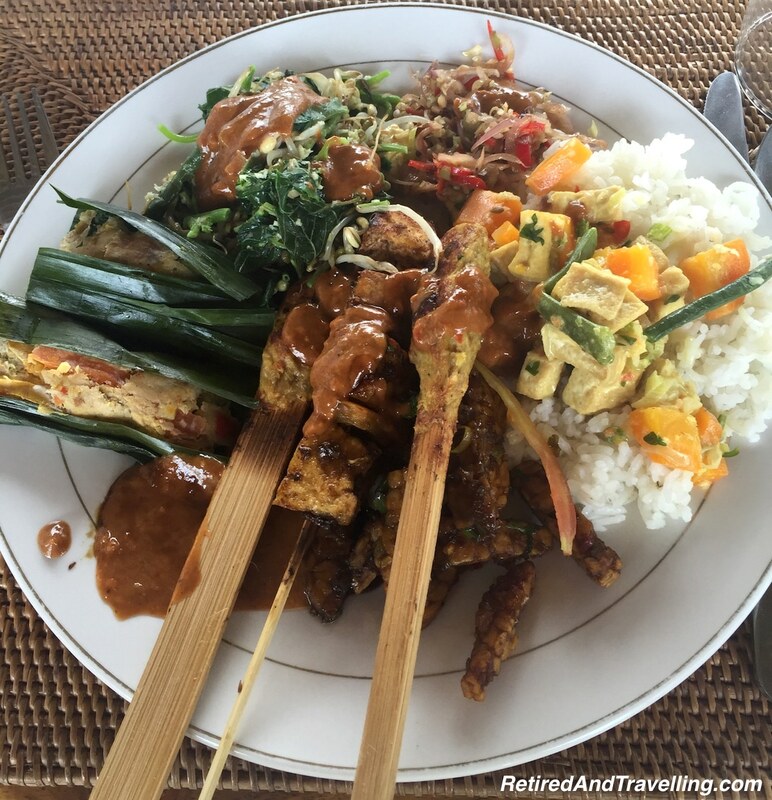 Nick enjoyed his days in Ubud. 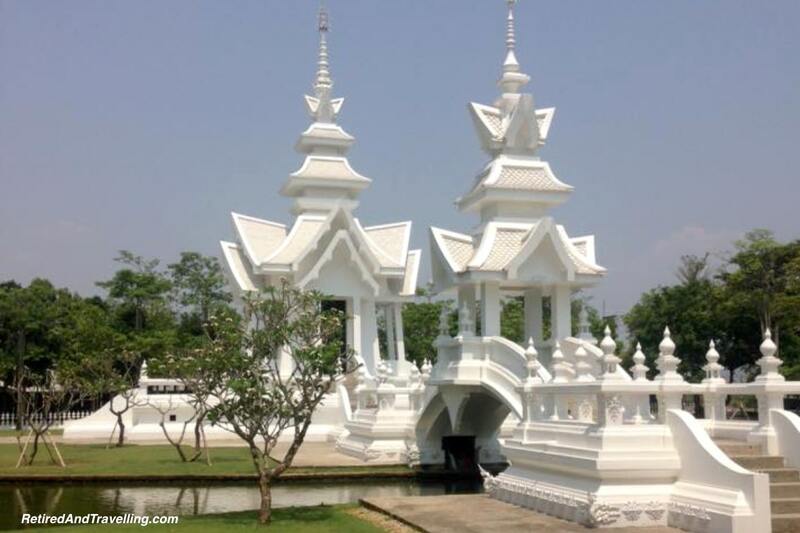 He found a great temple that was not the tourist trap that everyone else went to and enjoyed days in rice fields that were off the main road. He would have some definite suggestions for us when we joined him in Bali! Nick and his friends headed to Nusa Lembogan for a few days for some snorkelling and cliff jumping. They had hoped to be snorkelling with Manta Rays but missed on that. 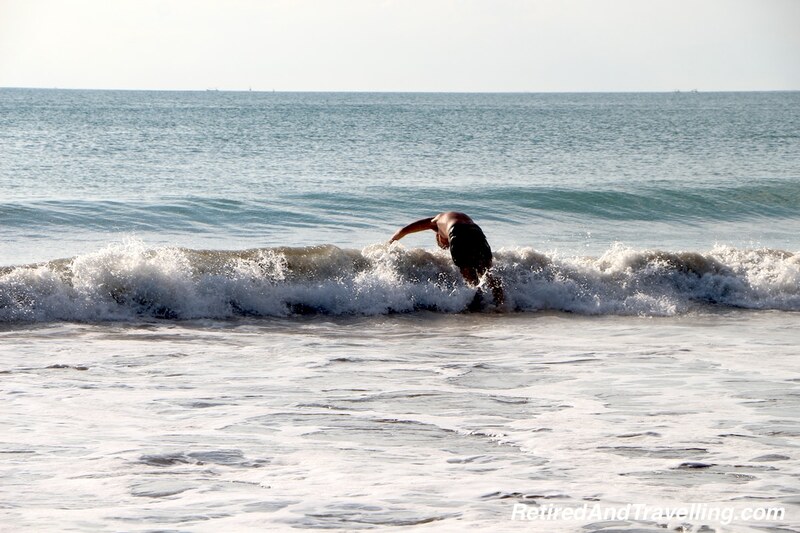 The pictures were a tease of the great water sports that we could enjoy in Bali. 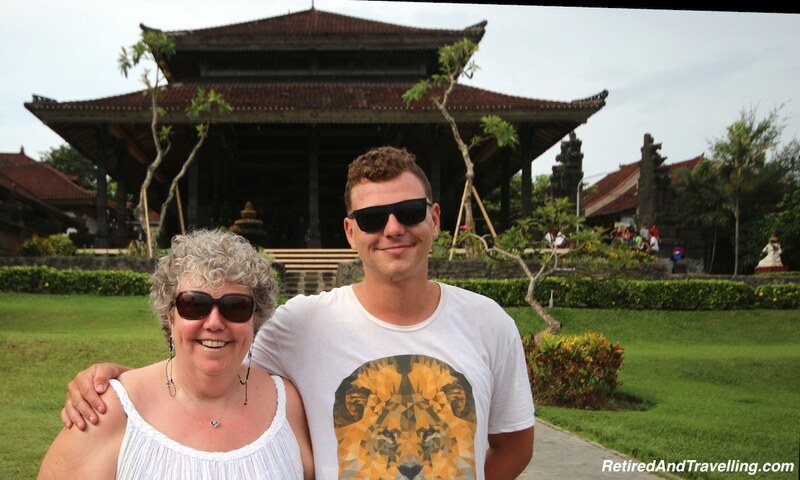 We enjoyed a week in Bali with Nick. 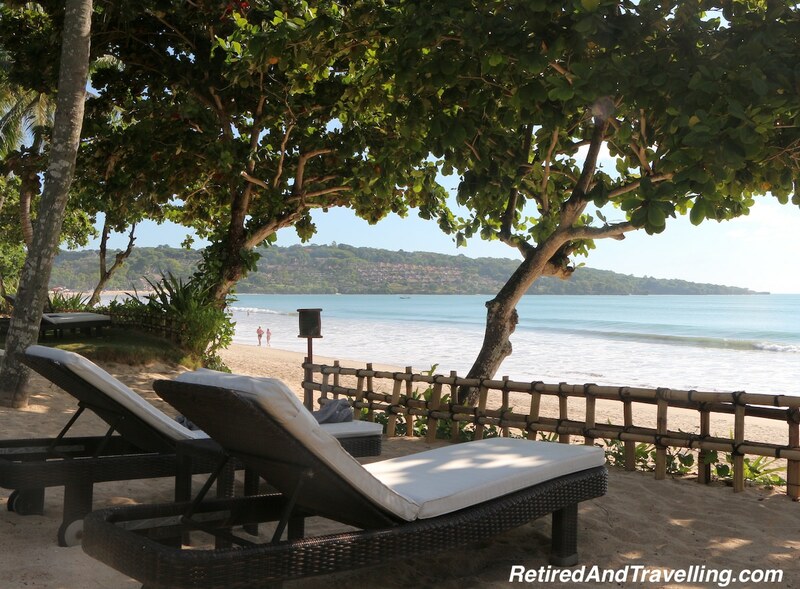 He was spoiled with a few days at our luxury resort on Jimbaran Bay before he returned to travelling on a budget on his adventures through SE Asia. 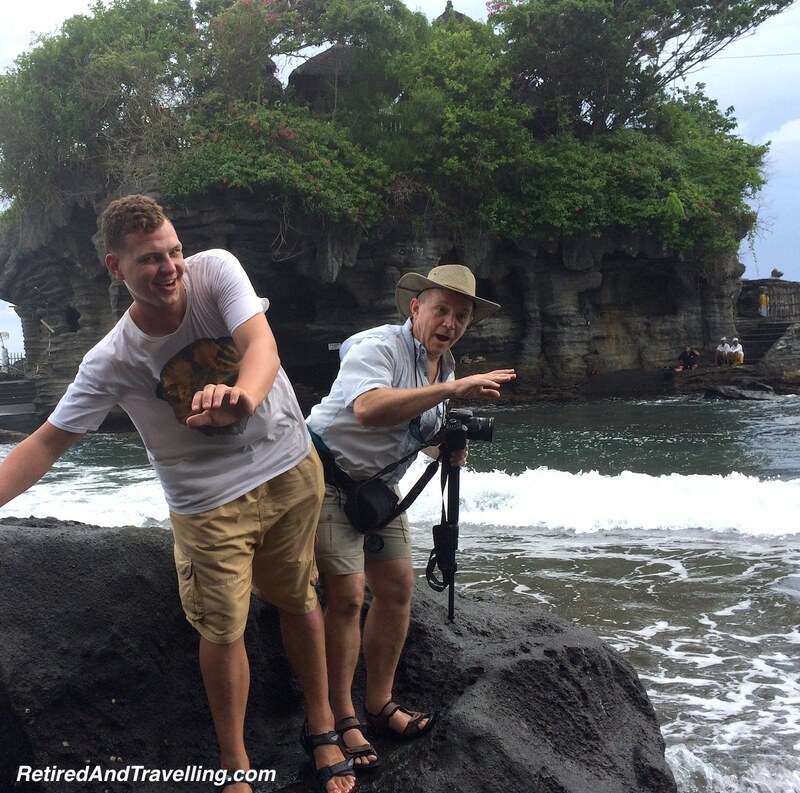 We travelled together for day trips to share what he had seen and tried a few new spots in Bali. 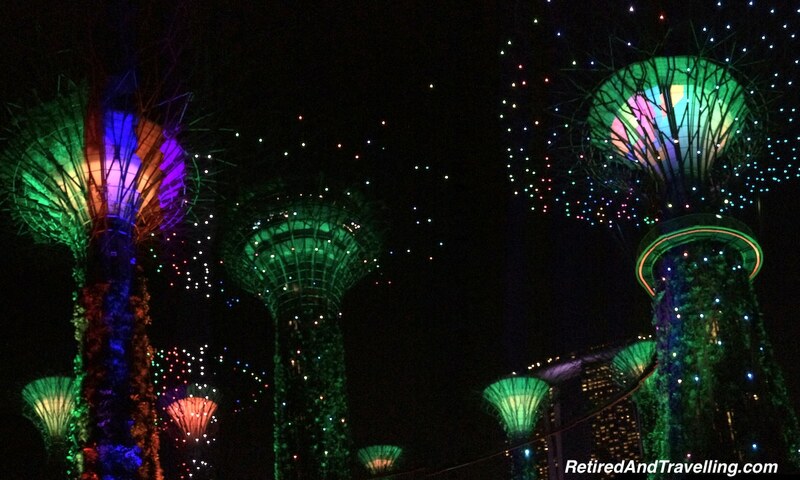 It was to be a quick 3 days in Singapore. Nick hung out with us for most of the 3 days as we toured Singapore by day and again by night. The day we arrived, Nick got tickets to go to the “7’s Rugby Tournament” happening in Singapore. He was happy that we arrived in time for him to catch Canada playing in the huge indoor arena. He had a lot of fun watching 20 short action-packed rugby matches in one day. Kenya pulled off a massive upset to win it all! We spent half a day in the 6 storey Sim Lim Square Electronics shopping centre. Nick was methodical in going floor to floor for his window shopping. Then he circled back to buy the things that ended up on his greatly expanded shopping list. He would have to ship home a package if he wanted to keep traveling with just his backpack. 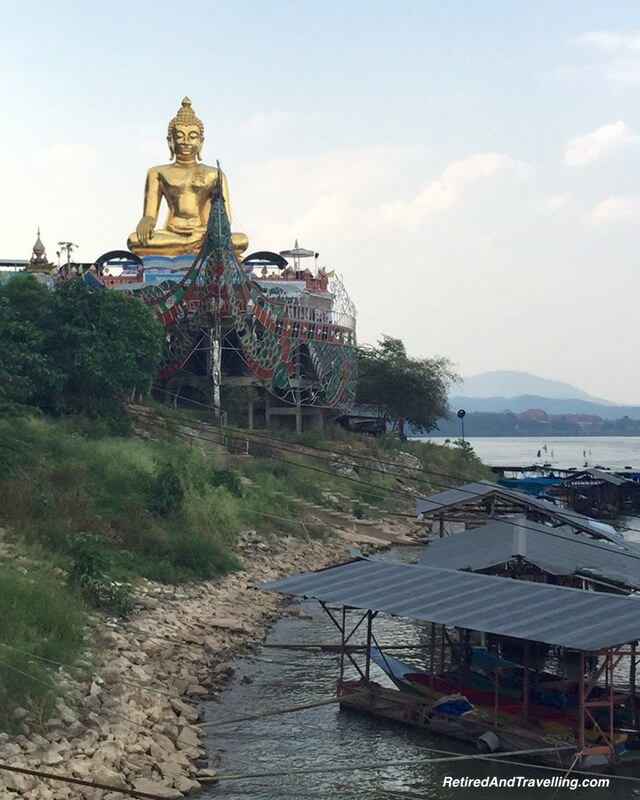 Nick had spent a few weeks in Thailand at the beginning of his SE Asia trip. He had loved it so much that he planned to spend another few weeks there before he finished his adventures through SE Asia. 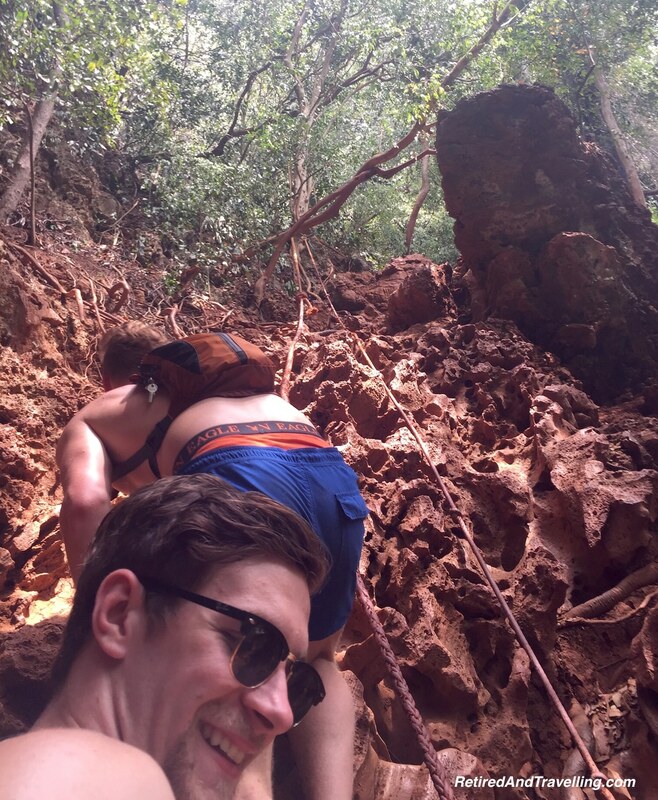 A friend of his from Vancouver joined him and they headed off to explore a different part of Thailand than we would visit on our trip. 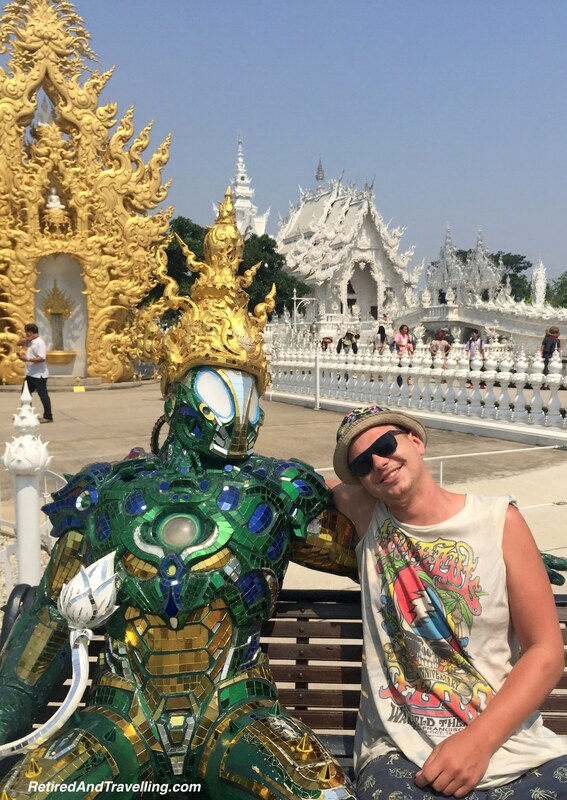 Nick and his friend Matt spent one night in Bangkok. They did a bit of sightseeing and then explored the Khaosan part of Bangkok at night. I did not get a long accounting of all they did in that part of Bangkok but I did see the video of him eating a scorpion. After that, I was not sure how much I really wanted to know about what they did in Bangkok. Nick had travelled mostly on very long bus rides on his earlier visit to Thailand. 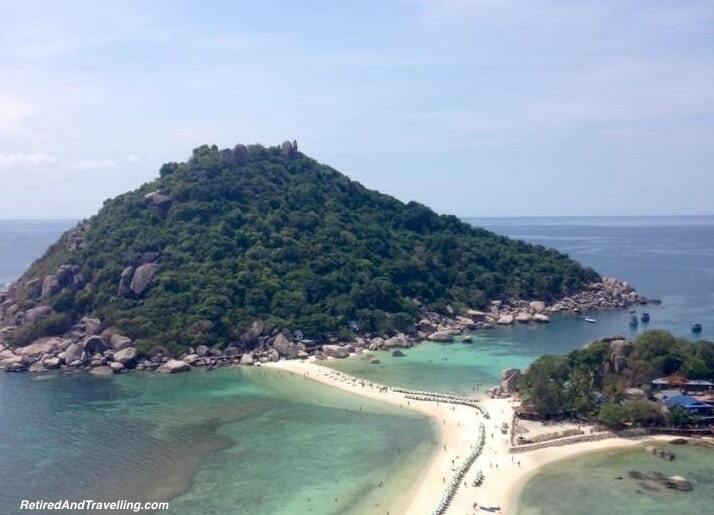 This time they were taking advantage of the great inexpensive flights within Thailand. They were off on their second day to Chiang Mai. Once landed they rented their scooters and off they rode. Matt would get his “Thai tattoo” when he came off his scooter too. That picture did not go on Facebook for Matt’s mom back at home. They encountered the police roadblocks and paid their “fines” until they finally found an online site that showed where the police stops were for the day. Nick had put a local SIM card in his phone so I got lots of pictures as he travelled. It was really great to see adventures through SE Asia from his perspective! I even got a FaceTime call from the highest point in Thailand! 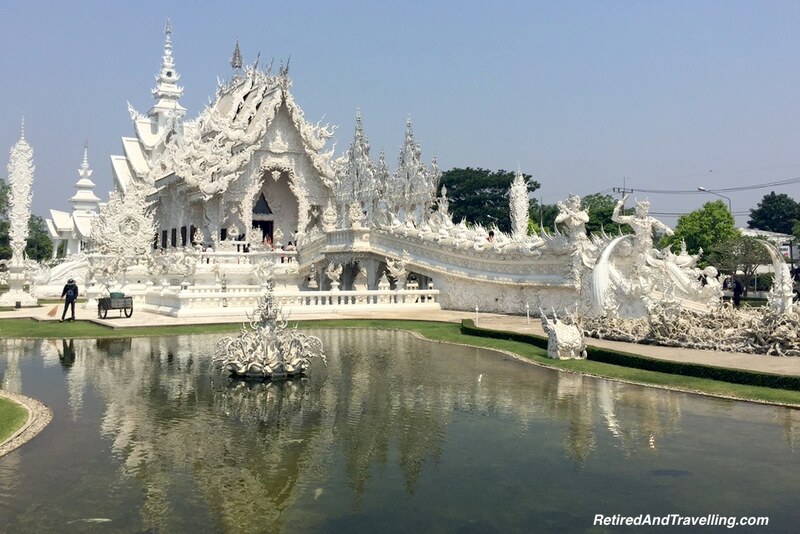 As the pictures rolled in from Chiang Mai and Chiang Rai, we were very disappointed to not have added that to our list. 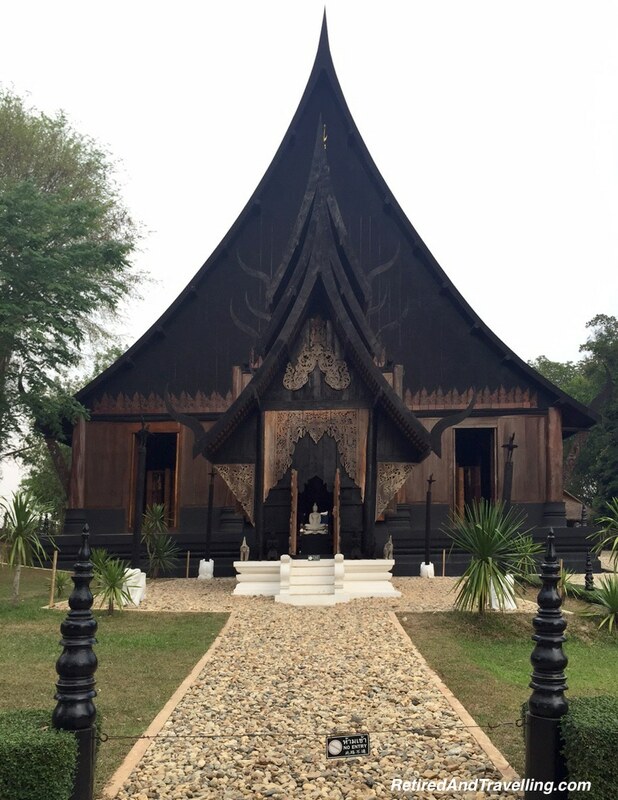 Nick sent back pictures of the beautiful White Temple, the Black Temple and his visit to the long neck tribe. 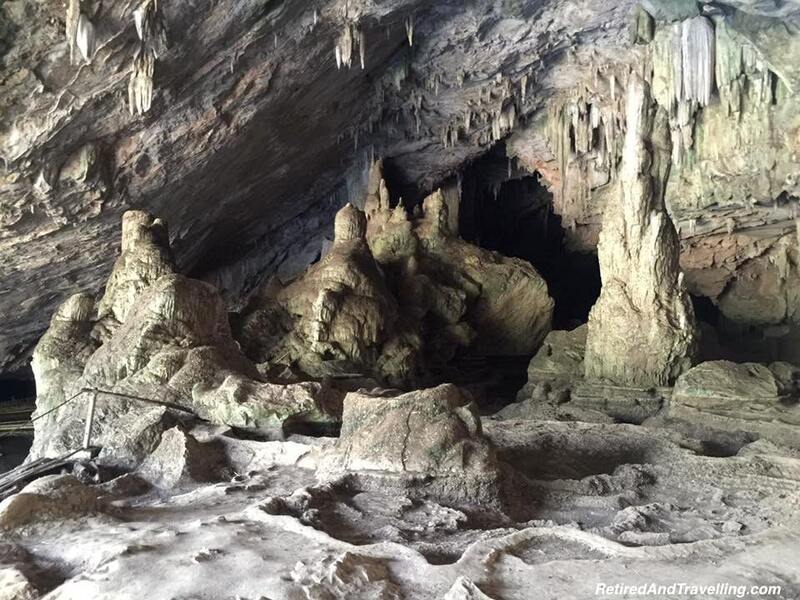 One day they took a long 135 km trip to the mountains, caves and hot springs in Pai. It seemed that everywhere Nick travelled on his adventures through SE Asia, he found other young adults to share stories with and head off for new adventures. He picked up an “International Crew” along the way! If the temple pictures left me with a sense of awe, the pictures of their visit to the elephant refuge tugged at my heart. Nick had wanted to see elephants but had refused to go to the very commercial sites he had seen where the animals were not treated well. 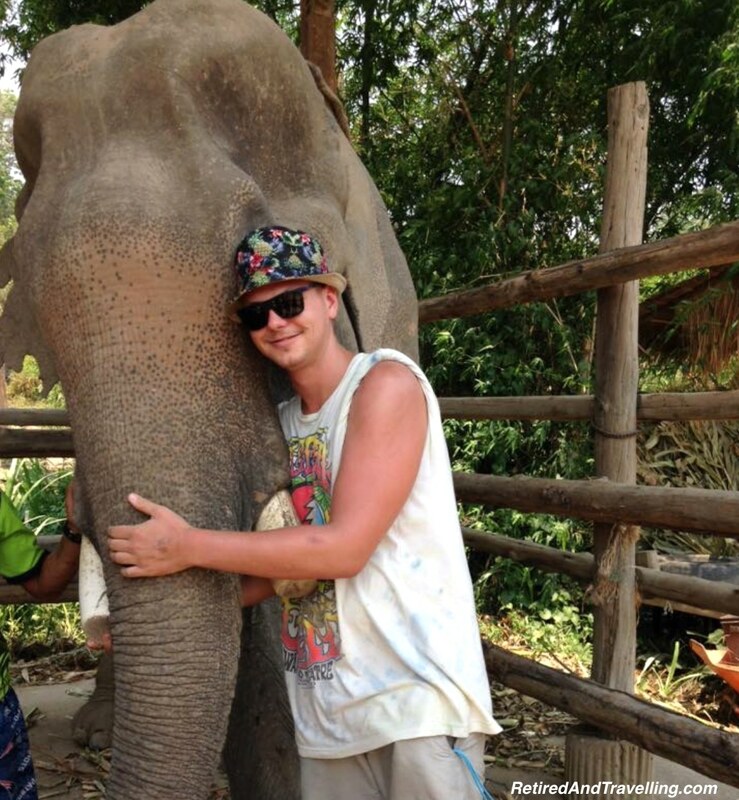 He did his research to find just the right place to see elephants in Thailand. They found another like-minded group at the elephant refuge. Part of the time was spent with Nick snuggled up to the elephants. 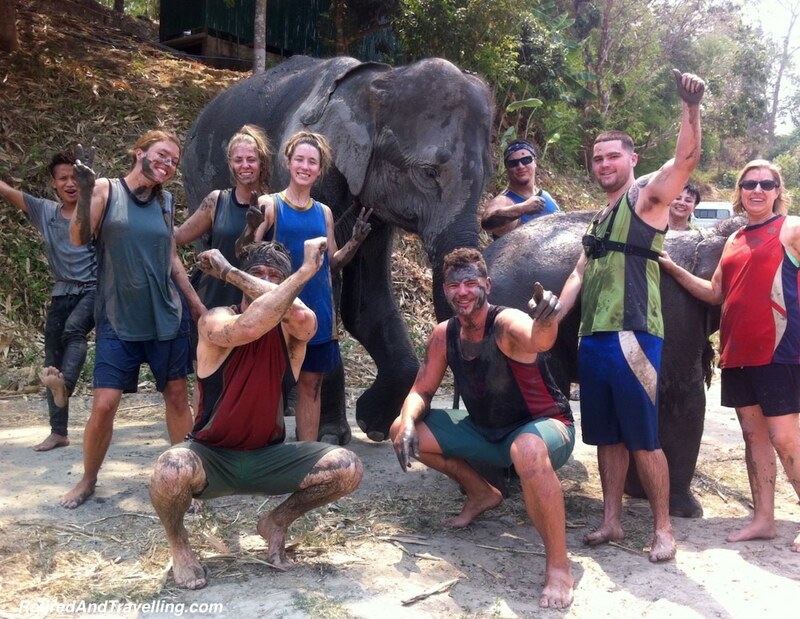 But after they were all covered in mud from being with the elephants all day, the gang found a fun way to clean up. 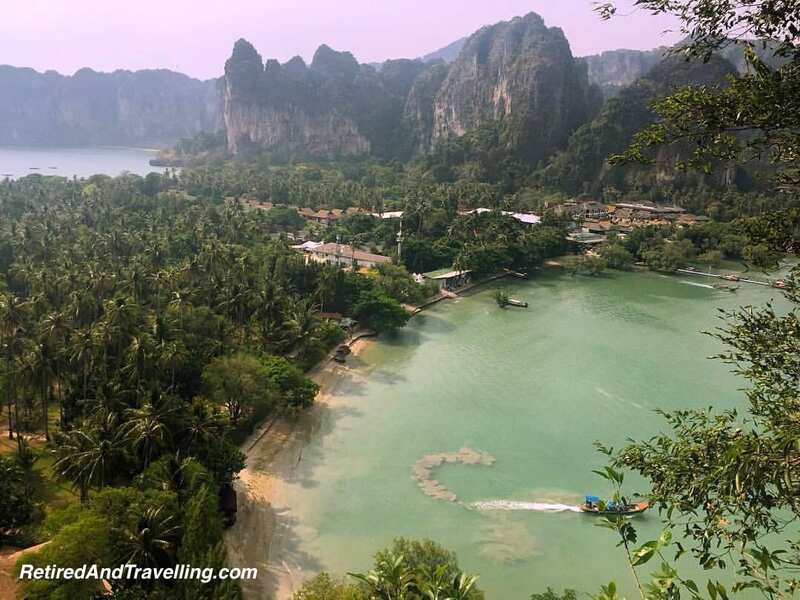 After visiting the northern parts of Thailand, Nick and Matt got on a plane to Krabi. We were in Krabi at that time, so after they got settled in, they got on their scooters for a visit. After cooling off in our indulgent private pool with a beer in hand, we headed out to find dinner. Waving goodbye from their scooters, they headed out to explore the Krabi area some more. Spending a day at Raillay Beach, they took time to enjoy the great beaches. 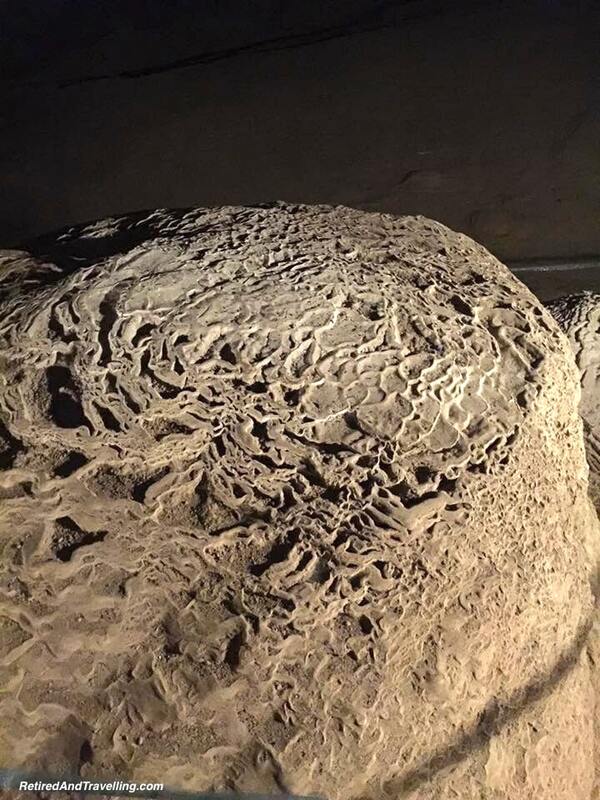 But then they decided that the limestone cliffs were made to climb. Scaling the cliffs was worth it for the view. Ko Phi Phi was on their plan for a few days. After a long bus ride and then a trip to the island, they found it expensive and a little more commercial than they had hoped. They enjoyed a few days before moving on to their last stopping point in Thailand. 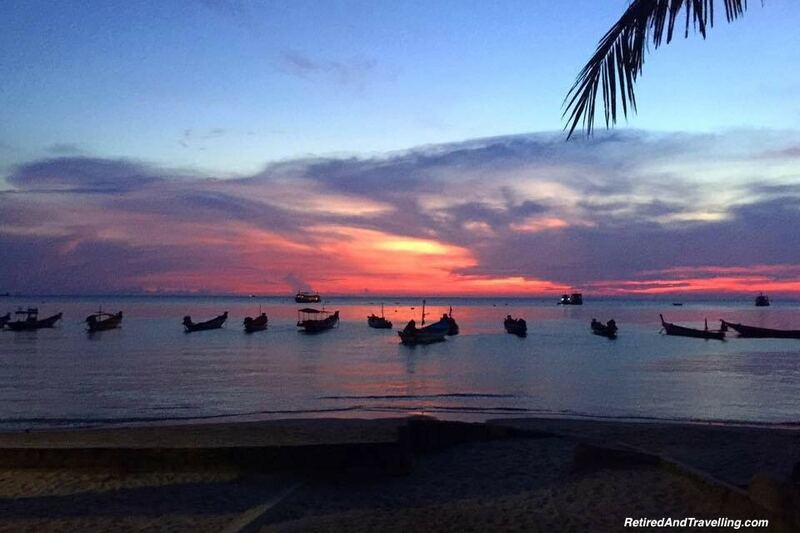 Nick had fallen in love with Ko Tao on his first visit. The locals he had made friends with watched his travels around SE Asia and were just waiting for him to get back. One of the locals he met (Lay) had challenges with texting in English but regularly sent Nick voice messages. Nick was so glad to return to Ko Tao. 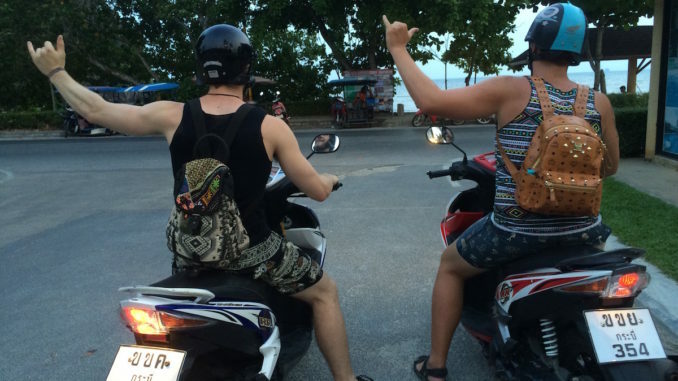 Nick had fun showing Matt all that he loved about Ko Tao. 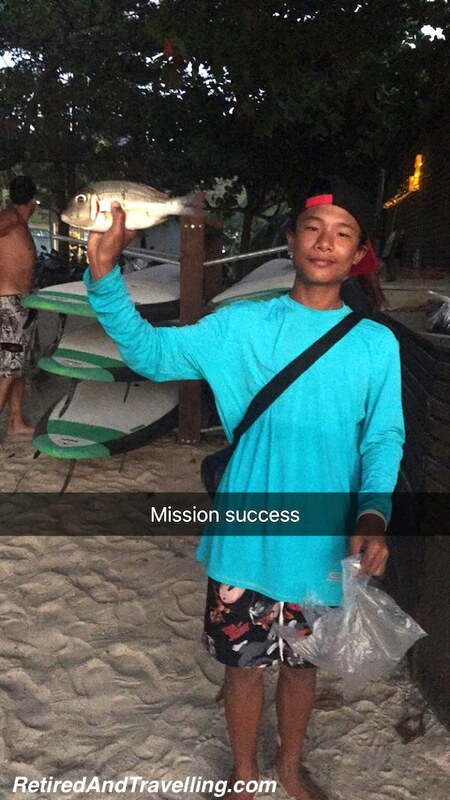 They went fishing and snorkelling during the day. And at night they would watch the fire dancers. Matt spins fire poi so he was able to learn and join in the shows. They stayed in the cheapest hotel on the island for most of the visit. 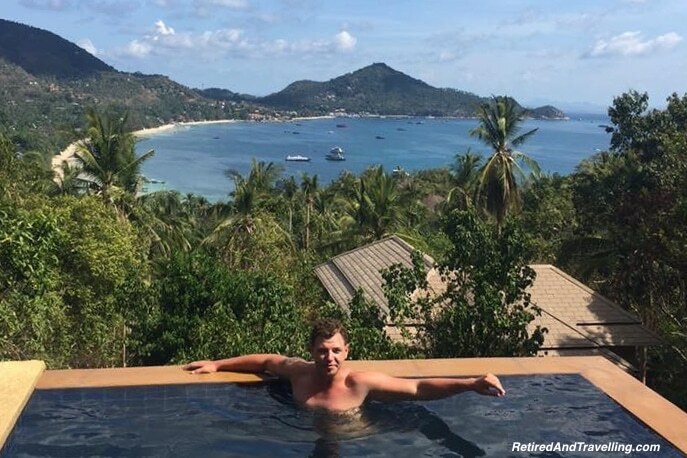 But when Nick celebrated his birthday on Ko Tao, he splurged for a few days for a villa with a view. And what a view they got from their endless pool looking out over the bay. At the end of 3 weeks in Thailand, Matt headed back to Vancouver. It had been great for Nick to have company and Matt got all the benefits of Nick’s adventures through SE Asia. Nick headed off to Australia for a quick 10 days. 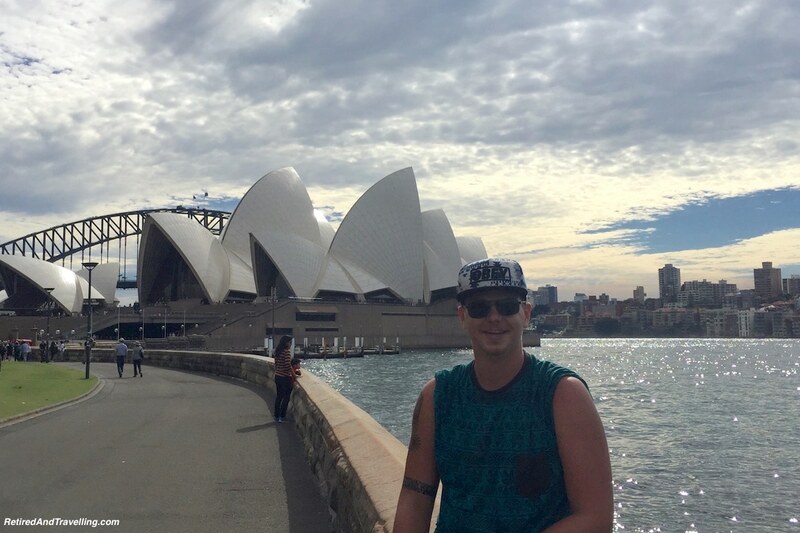 It was funny to see Nick’s pictures as he visited some of the spots we had been on our trip to Sydney. 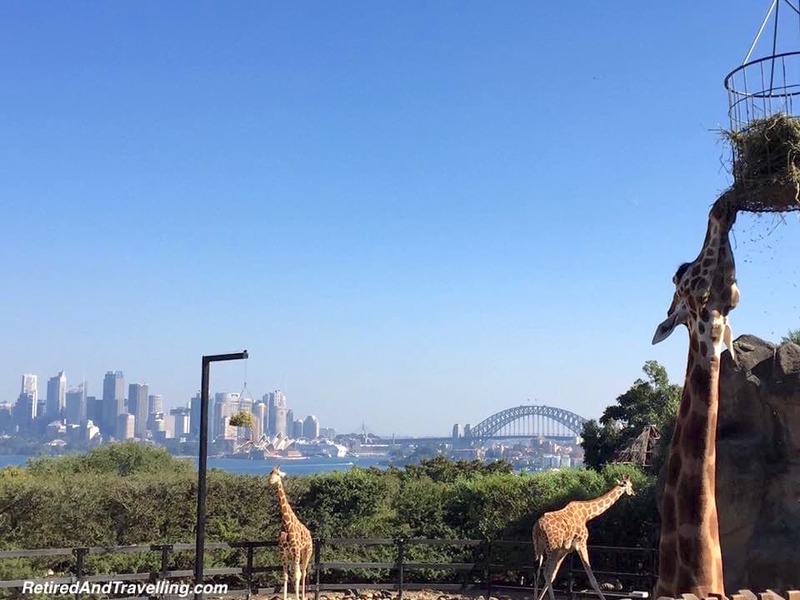 But he did manage see the Taronga Zoo. 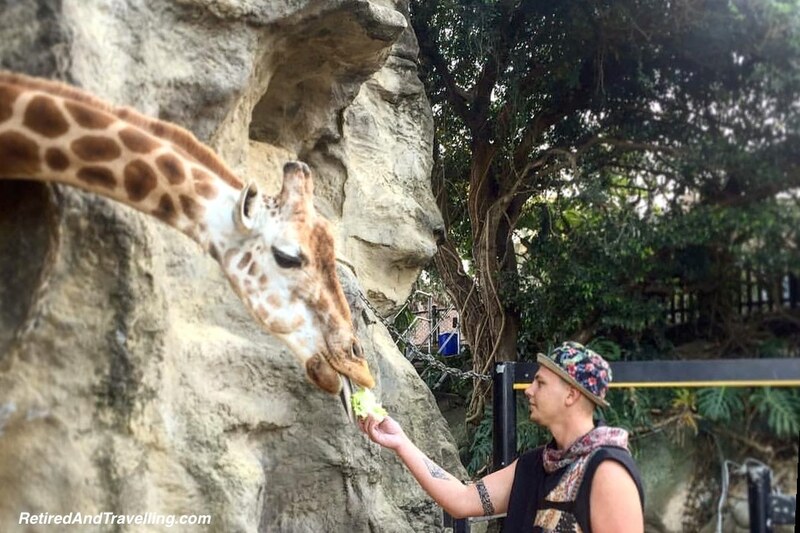 His overnight zoo visit let him do what he always wanted to do – interact more closely with the animals. And he got great views of Sydney. Nick headed home after almost 3 months of adventures through SE Asia. The trip had been a great reward for the year taken from his life as he battled cancer. It was great to see him enjoying life to the limit and regaining control of his life. He created some awesome memories and met many people he would keep in touch with. There is no doubt in my mind that he will be back! We learned many things on our first visit to SE Asia. 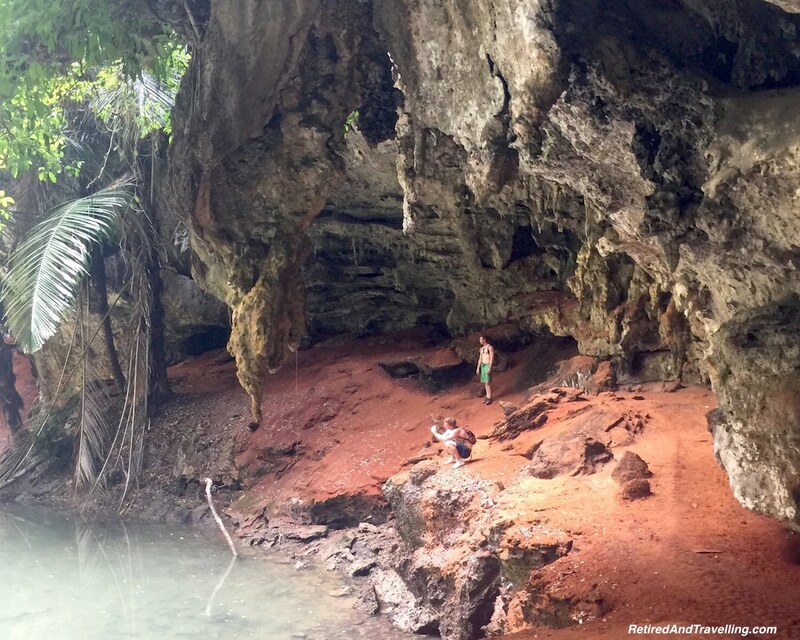 But some of the things that we learned came from travelling with our 22 year old son! Consider staying in a local residence rather than a hotel. It is may be significantly less money and you will get a more authentic local experience. A scooter will give you freedom to move about. This needs to be balanced against the risk of becoming one of those crazy scooter people and may be less practical if there is a group of you travelling. Don’t over-plan your vacation. Give yourself flexibility. Travelling with someone else may give you company but sometimes you need some time on your own. Get to know the locals and other travellers. They will help to enhance what you see and where you go. Don’t spend all of your time at the big tourist spots. Find your own path and explore. Enjoy a little luxury now and then as a treat. 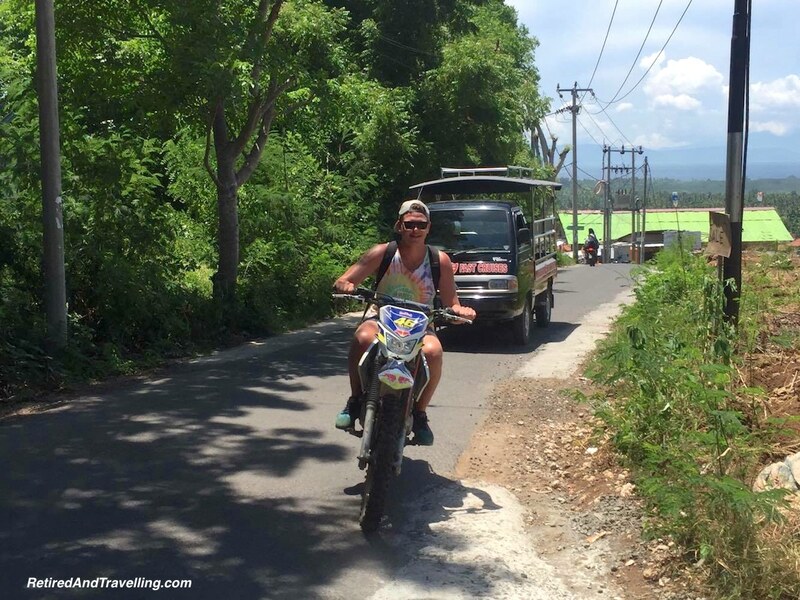 Nick had a great time on his adventures through SE Asia. We enjoyed some spots together but he travelled to many that we missed. His pictures and stories have added many places to our list of places to visit next. While we may never travel with the freedom and flexibility of a 22 year old, we will take some of the lessons we learned into our next travel adventures. 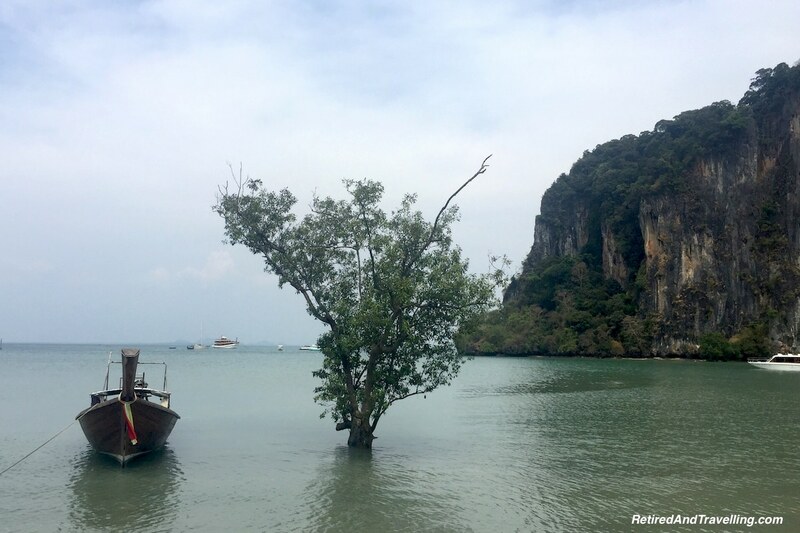 Are your adventures through SE Asia really that different when you are older? What else can we learn from younger travellers?